Imagine putting yourself in movie trailors or music videos available on Google Video, AOL Video or Youtube. It's like the transparent video playing on top of your photograph. We are just going to show how you can do it in two seconds. Before I even introduce Zen Mix, let me ask an easy question - How would you put own photograph to form the transparent backdrop of Stephen Colbert White House dinner video which is available on Youtube. Or say you want to make a background appearance during the entire length of the Zefrank show ? Download the video from Youtube in AVI format, import the picture and this video clip in Adobe Premiere Pro or Apple Final Cut pro, edit them and then export the mashup video back in avi or wmv format which can be uploaded to Youtube. But what if you don't want have any of the video editing software ? Or the Youtube/Google video is 2 hours long and downloading it may take centuries on my internet connection. What's the easy way to this ? Simple, use Zen Mix - You won't have to download or install anything but this online video-picture mashup serivce will blend the two files in various modes like add/subtract/overlay etc depending on what kind of blend you are are looking at. You will need to provide ZenMix the full URL of the video file in flv format and the picutre in jpg format. 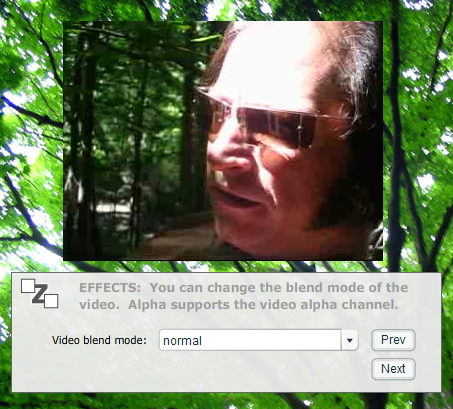 Then choose the location of the video on the picture and the blending mode. Zen Mix will then provide you the location where you blend video is stored. The service is just too much fun and the only limit is your imagination. I am trying to get the Green Screen effect (or chroma keying) with Zen Mix that makes all the areas behind me as trasnpare and just shows the background picture which can even be the Oval office.